This entry was posted on Wednesday, October 5th, 2011 at 10:45 and is filed under 3a) News and Comments, 3c) Falsification tests. You can follow any responses to this entry through the RSS 2.0 feed. You can leave a response, or trackback from your own site. Would it be possible to go back to old data from weather satellites and do a simple analysis of their photos to determine % area covered by cloud every day? Or is that what SOBS is? I’ve searched for some definition of lower troposphere but have had no luck. My memory vaguely suggests that it is up to around 18 thousand feet. If that is so, then I wonder how relevant are the cloud cover figures presented here. 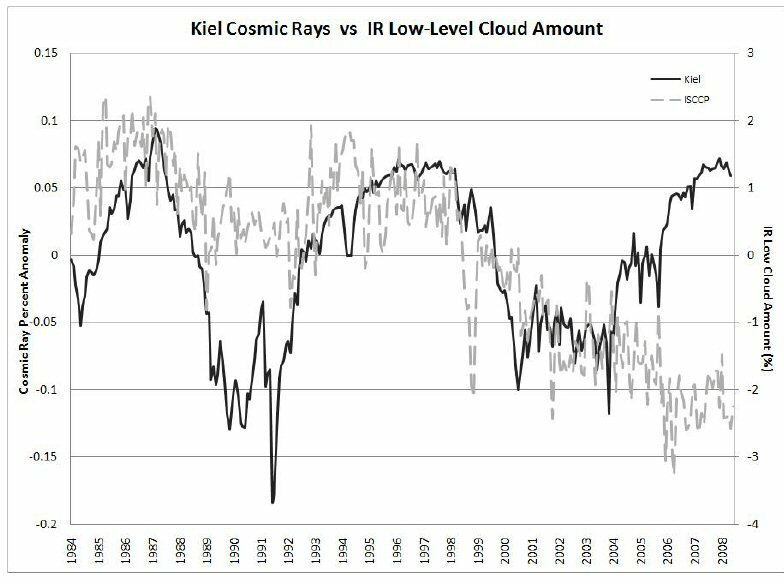 My bet is that the cloud driver of albedo is in the boundary layer, normally up to 2 or 3 thousand feet, and it is there that the aerosol/cosmic ray effect should be researched. Good luck with trying to quantify cloud cover at that level: even direct visual observations, which in my day consisted of a met man peering around the airfield and mumbling something about oktas, will offer little definitive guidance. 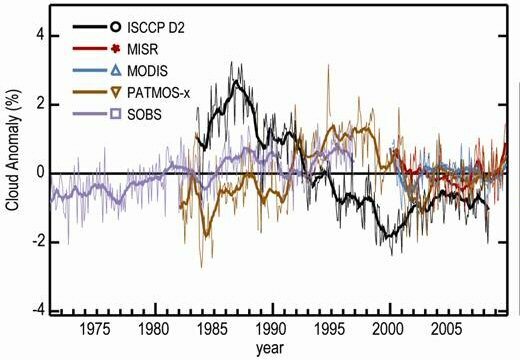 My Kriegesmarine hypothesis (perhaps I should warn you that I am unqualified to advance this) is that CCN production has been disrupted by pollution at the ocean surface: fewer CCNs, less stratocu, warmer oceans. To assess this one would have to know what has happened to stratocu cover (a Google on Tom Wigley and ‘why the blip’ gives some idea of the thrust) from 1850 onwards. There’s a version of the whole thing at Judith Curry’s site. Without knowing what we are doing to aerosol production, there is no way of knowing what GCRs are doing. I don’t think this paper addresses enough of the unknowns to be of value. The lower troposphere of interest to Svensmark is below about 3000 metres. The graph looks kinda like a “Hockey Stick“, or Solyndra shares after the Big Loan. I wonder… did Mann, or the White House, have anything to do with the “professional academic”, pre-publication, “technical review” and “correction” of this latest attempt at post-modern climateology for anthropogenic global warming enthusiasts? I can see smoke and a few mirrors and smell something mysterious. Where’s Pachuri?